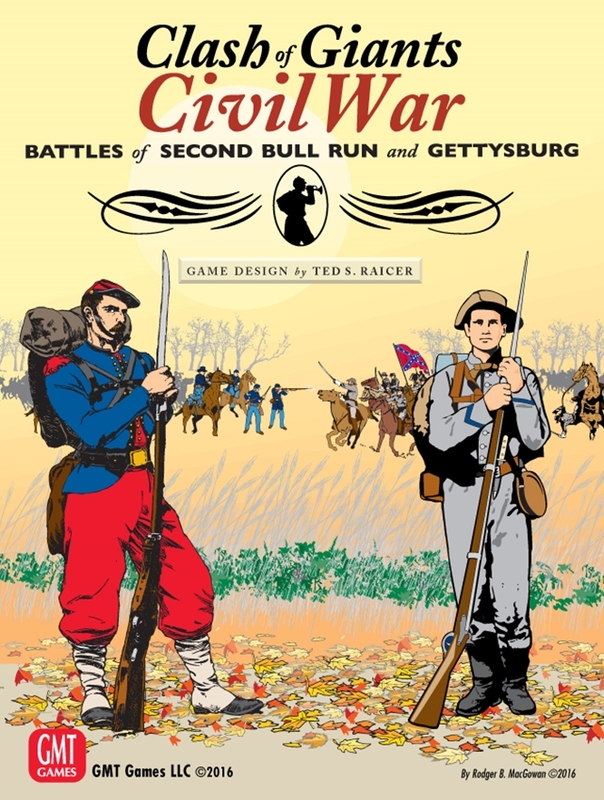 Clash of Giants: Civil War, takes the game system from Ted S. Raicer�s popular and critically acclaimed Clash of Giants WWI series to two of the storied battles of the American Civil War: Second Bull Run and Gettysburg. CoG: Civil War uses a modified version of the chit-pull Activation system of Clash of Giants II: Campaigns of Galicia and First Ypres, 1914, while retaining the CoG combat system. Every (mostly brigade-level) unit has a Tactical Efficiency Rating based on its morale, training, leadership, and experience, but even a poor unit can have a heroic moment, while the Iron Brigade might not always be made of iron. It is a true player�s system, which produces realistic results without a lot of fiddly procedures, and allows players to concentrate on the game rather than the rules. Units in CoG: Civil War are mostly infantry brigades, (with the odd cavalry brigade or demi-brigade). Each day is divided into four day turns and one night turn. The maps depict woods, hills, steep hexsides, railway cuts and embankments, roads, rivers, creeks, bridges, towns, marshy ground, and the Devil�s Den at Gettysburg. The Activation rules, which combines random formation activation (mostly corps for the Union and divisions for the Confederates) with variable movement allowances, creates the fog of war and friction so important to Civil War battles. Ordering your corps commander to take a hill is one thing-getting him to act as you wish is another. And because these effects are achieved without hidden counter/dummy unit mechanics, CoG: Civil War is not only a fast-paced two-player game, but excellent as well for solo play. Some Activation markers also allow you to coordinate more than one formation, such as Longstreet at Gettysburg. But don�t expect Old Pete to do so early in the day! One thing that speeds play in CoG: Civil War is the unusual treatment of artillery. There are no artillery units depicted; instead artillery appears as Combat Support Markers which are added (attacker first) to the combat strength of engaged units. Artillery CSMs are generally assigned to a specific division or corps, though army reserve artillery can be used to support any units. Artillery cannot be used in combat in certain terrain (woods or town hexes), but there are no line of sight considerations to slow down play or complicate the rules. Instead both line of sight and enemy counter-battery fire are handled with an elegant abstraction: each turn all available artillery CSMs of both sides go into a cup, and then half are randomly drawn. Whatever comes out of the cup is available for use that turn, so the player with more artillery on the field is more likely to get artillery support. This also allows a simple way to model the effectiveness of the Union Artillery Reserve at Gettysburg; once arrived, these markers never go in the cup, and are always available for use. Overall, CoG: Civil War�s portrait of artillery as an occasionally decisive but definitely secondary arm is arguabley more realistic than many more complicated designs. The two battles, Second Bull Run and Gettysburg, depict one of Lee�s greatest victories, prior to his first invasion of the north, and his greatest defeat during his second invasion. Both are meeting engagements, with limited forces deployed at the start, gradually building to mighty clashes. The arrival of fresh forces is another area where the game system allows variability: units may be delayed or arrive at the wrong road. You can even attempt to speed the arrival of your off-board forces, but at increased risk of their arriving later instead. Winning involves a combination of taking and holding victory hexes, exiting units, and inflicting casualties. You can also earn victory points to compensate for units whose arrival is delayed-but only if you didn�t try to force march them to an earlier arrival! Players will have to judge trading losses for taking or holding tactically important ground. Special rules cover such things as General Pope�s confused and confusing orders at Second Bull Run, the Confederate grand battery on the third day at Gettysburg, the use of the Union VI Corps as a reserve in both battles, cavalry delaying actions and retreat before combat, rallying units at night, and the actions of certain key leaders. But though there is enough chrome to give each battle a distinctive flavor, the action remains uncluttered, quick-playing, and exciting. Not simply �another Civil War battle system,� CoG: Civil War presents a fresh new look at an oft-game topic. Giving each side a chance to change history in an afternoon�s gaming, the use of the Clash of Giants system also shows the sometimes surprising links between the battles of the Civil War and the opening battles of the Great War 50 years later. Fans of either the Civil War or the Clash of Giants series will not be disappointed.